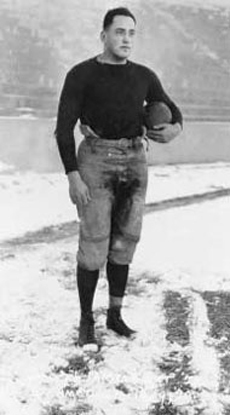 Joe Alexander was a three-time All- America lineman at Syracuse University, in 1917 and 1918 at guard, and in 1919 at the center position. Alexander’s roving style was akin to the modern linebacker—unique in the early days of college football—and he was the team’s offensive signal caller from his line position. and, finally, the New York Giants from 1925 to 1927. When the Giants were granted a National Football League (NFL) franchise in 1925, Alexander was the first player signed by the New Yorkers. He was named to the NFL All-Star team that year. A practicing medical doctor since his college graduation in 1921, Alexander was one of the few Giants to receive a yearly salary. He took over as Giants head coach in 1926, but relinquished the job in his final year with the team.